12-month membership. Available to currently enrolled CSUN students only. 12-month membership. Available to current CSUN faculty & staff members. Retired & Emeriti faculty/staff are also eligible. 12-month membership for two members in a marriage, family or partnership living at the same address. Covers the lifespan of the member. Includes jacket. Payment plans available. Covers the lifespan of two members living at the same address. Includes jackets. Payment plans available. *10 percent of your Alumni Association membership dues are tax deductible and are specifically designated to support scholarships for CSUN students. 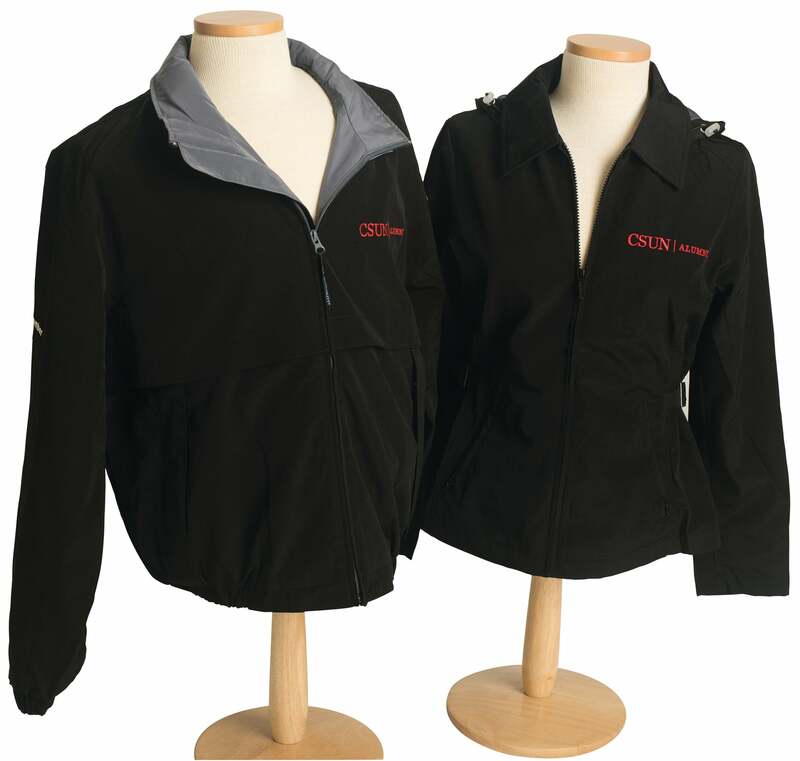 Get this exclusive member jacket with your Lifetime Membership. Available in men’s and women’s styles. CHECK OUT YOUR MEMBER BENEFITS HERE! Membership in the California State University, Northridge Alumni Association is open to all individuals who have attended CSUN or would like to support the mission of the University. As CSUN alumni, you can take pride in knowing that over 350,000 CSUN graduates are making a difference in communities globally. Join us in providing scholarships, mentoring students, serving on university advisory boards, or networking with fellow alums. Please Note: After you successfully sign up online, you should receive a confirmation email. If you did not receive this email, please check your spam box. If you do not have the same home and billing address your payment will NOT process. If the name on your credit card does not match the name of the person who is signing up, your payment will NOT process. Please call our office to complete your payment over the phone. We are sorry for the inconvenience. If you receive a "Fraud" or "Error" message when signing up, please STOP and call our office at 818-677-2786 and we will process your payment over the phone. Thank you. Association membership is the best way to strengthen your proud alma mater. Volunteering and networking with other alumni means a stronger future for the university and for you. Stay connected to other CSUN alumni and friends through our Northridge Network, any of our 25 chapters, and other annual social events. Your membership also strengthens our student scholarship fund. With more than 40,000 students and 4,000 employees, Cal State Northridge is the intellectual, economic and cultural heart of the San Fernando Valley and beyond. Join the Alumni Association and be part of building an even stronger CSUN. We strive to find a variety of programs that provide useful benefits in the form of discount privileges and member services. Memberships are non-transferable and benefits are subject to change. Membership cards will be mailed within 7-14 business days. If it has been 14 business days and you have not received your membership card, please call or email our office to confirm your home address. If you have any questions about the privacy or the use of your information or would like to contact a staff member in the Office of Alumni Relations, call (818) 677-2786 or email alumni@csun.edu. To opt-out of being contacted by our affinity partners (companies that we partner with to offer products or services to our alumni), please go to our Opt-Out page. I Need a Proof of Membership, What Should I Do? Most companies will accept the confirmation email you should receive after signing up. If you did not receive a confirmation email, check your spam folder. If it is not there you can email us at after 48 hours of signing up (it takes 48 hours before we can see your payment) and we will email you a proof of membership. How Long Before I Can Use the Student Recreation Center? It will take 5-10 business days before you are in the gym's system and they will allow you to sign up with them. Best practice: Wait until you receive your card and then you are good to go. Do I Need to Pay to Park on Campus? Everyone must pay to park on the CSUN campus. All persons using CSUN parking facilities are to park in designated parking areas and spaces and must purchase the appropriate parking permit before parking in designated areas and spaces. You may either buy a daily pass at an information booth, or pay by space or metered parking in Parking Lot B5 and Residential Parking Areas. All parking information can be found on the Parking & Transportation Services website. Can My Child (under the age of 18) Join the Alumni Association and the Student Recreation Center With Me? Only those 18 and older can sign up to use the SRC individually. Children under 18 can sign up at the SRC as a dependent (as long as a parent or guardian signs up as well). There are specific dependent hours and rules at the SRC. Please review these before making a decision. How Long Before I Can Use the Career Center? You must wait 48 hours for your membership to process and then you can go into or call the Career Center. The Career Center can call our office to confirm your membership. They will also accept your proof of membership or confirmation email. How Long Before I Can Use the Oviatt Library? You must wait 48 hours for your membership to process and then you can access the library. The library can call our office to confirm membership. They will also accept your proof of membership or confirmation email if you cannot wait until your card arrives. Please see our list of Oviatt Library benefits you will and will not have with your membership. Can I Add My Spouse/Partner to My Single Annual Membership? If you signed up in the last 3 months you may either mail us a check for the $10 difference, or call us and we can take your credit card information over the phone. If you did not sign up in the last 3 months you will have to wait until your renewal date in order to upgrade to a Joint Annual Membership for $50. Can I Add My Spouse/Partner to My Single Lifetime Membership? Yes, you may either mail us a check for the $100 difference, or call us and we can take your credit card information over the phone. 10 percent of all Alumni Association memberships are tax deductible and are specifically designated to support scholarships for CSUN Students. Is Joining an Alumni Chapter Free or Do I Have to Pay an Additional Fee? Can I Join Two Chapters? Joining an alumni chapter is free with your alumni association membership. You will have the option to select a chapter when signing up. You can only select one chapter when signing up (your primary chapter), however if you would like to receive information from multiple chapters, you can register to create a profile on our website and subscribe to any additional chapter you would like communication from. Registration on our website is only available to CSUN alumni and/or Alumni Association members. For assistance please contact our office at (818) 677-2786. I Have a Recurring Lifetime Membership Payment and Need to Update My Credit Card Information, Who Do I Contact? Please call the Donor & Member Services office at (818) 677-7330 to update your credit card information. Do I Need to Log In to See All the Membership Information on the Alumni Website? No. The only reason you would need to log-in to our website is to access our alumni directory. The alumni directory is made up of only CSUN alumni who have chosen to put their personal and/or professional information online. If you are interested in having access to our alumni directory you can sign up here if you are a current alumni association member, and here if you are not. Alumni members get higher access to the alumni directory. To learn more about your access rights visit the alumni directory page. All of our memberships are final sale. For further inquiries, please contact our Membership Coordinator at (818) 677-6882.